I love researching my Regency era novels. For those of you who haven't ventured into research be warned: it's addictive, even if you're not a writer researching a story, maybe you just want to explore the past. Of course you have to love history or it might not have the same effect on you. :) I'm a counselor and have worked in the mental health field for years so it shouldn't surprise anyone that I'm fascinated by books like: Undertaker of the Mind: John Monro and Mad-Doctoring in Eighteenth-Century England (Medicine and Society) by Jonathan Andrews and Andrew Scull and Customers and Patrons of the Mad-Trade: The Management of Lunacy in Eighteenth-Century London, With the Complete Text of John Monro's 1766 Case Book by Jonathan Andrews and Andrew Scull. The movie Miss Austen Regrets depicts a jealous Jane Austen silently fuming over the attentions paid by a young doctor to her 22-year-old niece, Fanny Knight. The doctor, Charles Thomas Haden, is portrayed by Jack Huston, with Olivia Williams as Jane and Imogen Poots as Fanny. More information here. Giveaway Question: Want to share some research you've discovered related to medicine? Or ask what historical medicine question you've always wondered about? I'll put your name in a drawing for my third book, Mystery of the Heart, which can be read as a stand alone novel. Just leave a comment related to these questions no later than midnight Pacific Time July 30th. I'll post the winner in the comments section and in the sidebar on August 1st. I've also got a new journal page called Jill's Quill appearing soon at my website. I love research and digging up old facts. I would get sidetracked on what I was trying to find out. It's all interesting! The medical aspect is very interesting. Since we run to the doctor for everything it seems, what did they do then? Medicine wasn't as good; some things hadn't even been discovered yet. If someone developed breast cancer or had multiple personalities, how were they diagnosed and what did they do for them? Thanks! Even with complaints about the medical field that we may still have today we're blessed to have what has developed over the centuries. Can you imagine having a mastectomy without the use of anesthesia? They did that! Just like limbs were amputated without anesthesia. Horrific! People were easily admitted to lunatic asylums and many chained to the wall so those with multiple personality may actually have been able to stay out of bedlam so to speak if their personalities were cunning enough to fool others. I've never studied a lot about strokes in the late 1800's. But I do like weird books. :) Here's something for you and others to check out when you get a chance. My Stroke of Insight by Jill Bolte Taylor. Fascinating. You can view her speech at www.tedtalks.com Something that all of us should watch. What did you do with all those books!? My family would have a fit if I brought that many books home. As it is they cringe every time I say I'm going to the library. :) What years does the Annals of Medicine and Pharmacy cover? I'm intrigued. Thanks for your interest. I think the history of the stethoscope is amazing. It's fun to find out how the medical community discovered ways of making advances. It that is neat how the stethoscope came into existence... As a nurse I love learning about stuff like that... Although I have to admit I am glad I wasn't around when they were just starting to experiment and do surgeries! I hear you Lisa. It's like working in a hospital. I love counseling the nursing students in our hospital, I just don't want to be the patient. :) Thanks for stopping by. Jill, as a nurse I found your post very interesting. I've actually had a patient who had porphyria, though he was in my ER for something else. He didn't know anything abou t George III. Glad you liked the post. I've never known of anyone who had porphyria, they do have a website for patients and families. I think there are a lot of people who know nothing about George III. But now that there is a royal baby George everyone may be getting educated over the years about all those guys named George. Loved your article. Medicine has always been a love of mine. Dr Quinn Medicine Woman is still a favorite because she always used herbs and some natural remedies when she could. Is there records of 'herbs gone wrong" in 1800 medical books? We always try to treat ourselves with natural when possible. Thanks for the chance to win! Great question. Herbs gone wrong. Hmm. Not sure but there is certainly the potential for that I would think like any other medicines. First thing that comes to mind is the opium poppy. Before it was regulated many babies died because mothers didn't know how much to give their children. And of course it was addictive. Ever read Thomas de Quincy's, Confessions of an English Opium Eater? I'm no expert but I would think there might be contraindications for what herb to use with other herbs or not. Make sense? I think you can probably overdose on just about anything. Depending on it's potentcy and size and weight of the child or adult might make all the difference. Any one else have some thoughts? Hi Jillian, thanks for a curiosity-inducing post! I have done some minor medical related research. I have MS, I've suffered with depression most of my life, I'm "blessed" with migraines (insert sarcasm here! ), I went to school to be a biblical counselor, and I'm about to have my colon removed next Tuesday the 6th--that's my most recent research. As more things have broken down on my young (36) body it's made me curious how my life/issues would've been handled in medieval, 1800's to early 1900's. I know what you mean by addictive!! It definitely makes me grateful to live in the present! P.S. 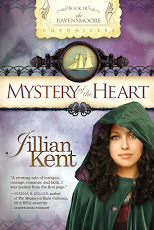 Thanks for the chance to win Mystery of the Heart. I'd love to read it while I'm stuck inside recovering from surgery next month! If you don't win the book see if your library will order the series and you can start with Secrets of the Heart while you recuperate. Was just reading today about the benefits of K-laser class 4 laser therapy treatments as an alternative to surgery & meds - possible treatment for my arthritis problems! Now that sounds fascinating too, bonton. I haven't heard about laser for arthritis. That's a long way from herbs and such. Thanks for sharing that. so I can get your address and get your book out to you. I'll also put your name in the right sidebar as one of our winners for this month. Hope you enjoy Mystery of the Heart. I am so excited, I will definitely enjoy the book! just realized I won your book and am soooooo excited! My email is jelliott53(AT)hotmail(dot)com Thank you soooooo much!